Trump has thanked secret service for protecting him. Republican presidential candidate Donald Trump has been rushed off stage at a campaign rally in Nevada. 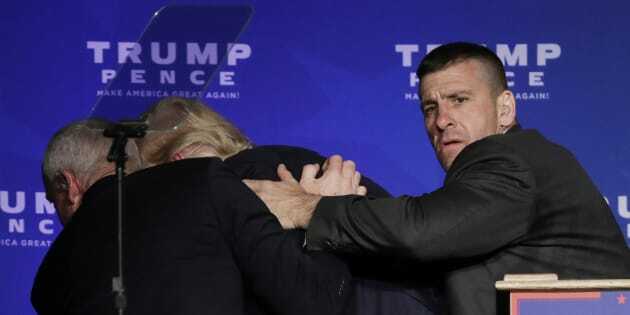 Security escorted Trump from the stage in Reno. A man was taken down by security forces in the crowd. Minutes later Trump returned to the stage to address supporters. "We will never be stopped, never ever be stopped" Trump said to applause. "I want to thank the secret service these guys are fantastic. They don't get enough credit." Trump reportedly thanked secret service "for their fast and professional response" following the scare. A senior law enforcement official that "no weapon was found" at the Reno Trump event, according to NBC News. With just three days to go before the US goes to the polls Trump and Democrat nominee Hillary Clinton are making last ditch pitches to voters across the country. Trump is due to hold rallies in Florida, North Carolina, Nevada and Colorado on Saturday, US time.